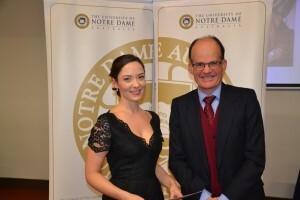 Zamaris Saxon is the recipient of the annual Kott Gunning Prize in Alternative Dispute Resolution in the Bachelor of Laws at The University of Notre Dame Australia School of Law, Fremantle Campus. This will be the third year in which this prize has been awarded to the student with the highest mark in Alternative Dispute Resolution, a required final year unit in the Bachelor of Laws courses offered by the School of Law. The School’s Dean, Professor Doug Hodgson, noted that “A prize of this nature assists us in impressing upon our students the importance and recognition given by the profession of the knowledge and skills acquired in this unit”. Alternative Dispute Resolution is a capstone unit and fosters the idea of the lawyer as a problem-solver consistent with the aims and philosophies of the University generally, notably excellence in teaching, scholarship, research and training for the professions. Notre Dame’s School of Law, Fremantle is a leading contributor to the vocation of Law. Its Law programs produce passionate, court-room and practice ready graduates who are valued by prospective employers across the industry for their ethical and intelligent contributions. The prize was presented to Zamaris by The Hon. Justice Robert Mazza of the Supreme Court of Western Australia, Chair of the School of Law Advisory Board. Zamaris is also the winner of the Jackson McDonald Prize in Law for the Best Fourth Year Student in 2014 and the Russell-Roberts Prize in Public International Law. Zamaris completed her double degree in Law and Arts, graduating in December 2014. She is currently undertaking a standalone Honours year.